Thank you, Judith, for clarifying this issue. Very interesting. I think it raises a much wider issue about copyright on digital content. It would be helpful if there were some universal guidelines on what is usable or embeddable for both “commercial sites” and “lone bloggers” such as myself, who is yet to earn a penny from my blog. But, of course, how can the amorphous and open-to-all worldwideweb, transcending national borders, be regulated and, indeed, enforced. It is confusing, however, when a large news organisation such as the Telegraph, for whom – somewhat ironically – I worked for six years – allows embedding of videos and then demands that hosting rights be applied for. I would be interested to read the thoughts of other journalists, both traditional and digital, on this. 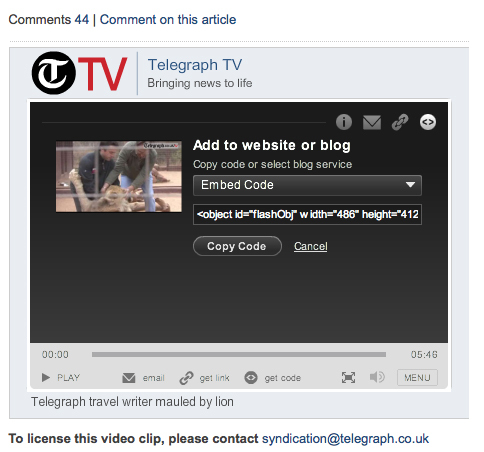 I would imagine the terms and conditions were written long before the Telegraph started using embeddable video. Now that the BBC have started syndicating their own video – with conditions attached – to the Telegraph and others it’s probably prompting many news sites to look at their own Ts & Cs. Adding the ‘To license this video clip…’ text is a half-arsed stopgap measure. As an industry we need to shake this issue out. Either it’s in an organisation’s interests to increase viewership of its video by allowing embedding – in which case it makes sense to allow it on commercial sites which typically have more users – or it isn’t. Time to choose.